Fertile soils require significant time to develop through the process of succession. Human activities may reduce soil fertility and increase soil erosion. Soil conservation strategies exist and may be used to preserve soil fertility and reduce soil erosion. How might ecocentrists and technocentrists differ over methods of soil conservation? Could there be new methods of food production that may help feed the world's growing population? 5.3.U1 Soil ecosystems change through succession. Fertile soil contains a community of organisms that work to maintain functioning nutrient cycles and that are resistant to soil erosion. The amount of time required for soil formations varies from soil to soil. Some soils develop more quickly than others. Phases of erosion and deposition also keep soils in a changing state. Organic matter releases releases acids and returns nutrients to the soil. Animals help break down organic matter, mix the soil, aerate the soil and add faces to the soil. 5.3.U2 Human activities that can reduce soil fertility include deforestation, intensive grazing, urbanization and certain agricultural practices (such as irrigation and monoculture). This shows that the soil degradation’s damage is world wide and occurs over 15% of the world’s total area. Human activities such as overgrazing, deforestation, unsustainable agriculture and irrigation cause processes of degradation. These include soil erosion, toxification and salinization. Desertification (enlargement of deserts through human activities) can be associated with this degradation. 5.3.U3 Commercial, industrialized food production systems generally tend to reduce soil fertility more than small-scale subsistence farming methods. ​A significant amount of chemical and energy input is required in commercial and industrialized food production systems. This is achieved through the application of synthetic chemicals, genetically modified organisms, and a number of other industrial products. This method usually alters the natural environment, deteriorates soil quality, and eliminates biodiversity. 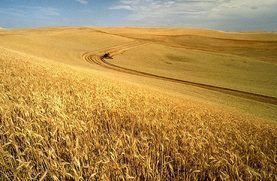 The goal of commercial and industrialized food production systems is to maximize the potential yield of crops.. In maintaining a conventional system, biodiversity, soil fertility, and ecosystems health are compromised. ​Sustainable agriculture is a more holistic approach to farming than conventional in that it relies on ecological processes, biodiversity and cycles adapted to local conditions, rather than the use of inputs with adverse effects Sustainable agriculture is a natural way to produce food and has a number of social, economic, and environmental benefits. 5.4.U4 Reduced soil fertility may result in soil erosion, toxification, salinization and desertification. Many poor farming and forestry operations encourage erosion. Erosion accelerates when sloping land is ploughed and when grass is removed from semi-arid land to begin dry-land farming. It accelerates when cattle, sheep and goats are allowed to overgraze and when hillside forests are felled or cut indiscriminately. While there are isolated instances of deserts being reclaimed by irrigation or of new forests being planted, man, in the majority of instances, degrades the soil when he begins agricultural operations. Poor management practices can also lead to low organic matter. This will result in poor water infiltration, poor water drainage, saturated soil, or compaction. These practices will limit the ability of water to infiltrate the soil causing an increase in the soil salinity and the soil’s ability to buffer salt. deforestation destroys the trees that bind the soil to the land and poorly drained irrigation systems turn croplands salty. the movement of refugees in the case of war, the unfavorable trade conditions of developing countries and other socio-economic and political factors enhance the effects of desertification. Due to the lack of alternative survival strategies, farmers tend to relentlessly exploit natural resources (food crops, water for drinking and washing, firewood) to the point that they are often over-exploited and cannot regenerate naturally. Soil nutrients and organic matter begin to diminish as intensive agriculture removes quantities of nutrients greater than the soil’s natural regeneration capacities. 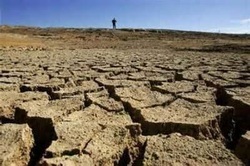 As a consequence, the soil is unable to recover, as it does during fallow periods, resulting is an ever-increasing spiral of environmental degradation and poverty, the principal causes of desertification. 5.3.U5 Soil conservation measures include soil conditioners (such as organic materials and lime), wind reduction techniques (wind breaks, shelterbelts), cultivation techniques (terracing, contour ploughing, strip cultivation) and avoiding the use of marginal lands. Strategies for combating soil degradation is not so common or widespread and to reduce this risk farmers are encouraged and informed about the processes and conservation methods. Farmers are in the need of beginning with extensive management practices like organic farming, afforestation, pasture extension, and benign (gracious) crop production. However to make this work policies need to be put into place. There are several methods farmers can use to reduce or prevent erosion. Mechanical methods are used to reduce water flow including bunding, terracing, and contour ploughing. The goal is to prevent and slow down the movement of rain water down the slopes. Vegetation cover methods use roots of crops to help bind the soil and decrease the action of wind and rain on the soil surface. Increased organic on the soil surface allows the soil to hold more water and reduce the mass, movement and erosion and stabilizing the soil structure. Soil husbandry is used to prevent damage to the soil structure. Care is taken to reduce the use of heavy machinery especially on wet soils and ploughing on soils that are sensitive to erosion. Both socio-economic and ecological factors have been ignored and integrated approach to soil conservation is needed, non-technological factors like population pressure, social structures, economy and ecological factors can determine the appropriate technical solutions. 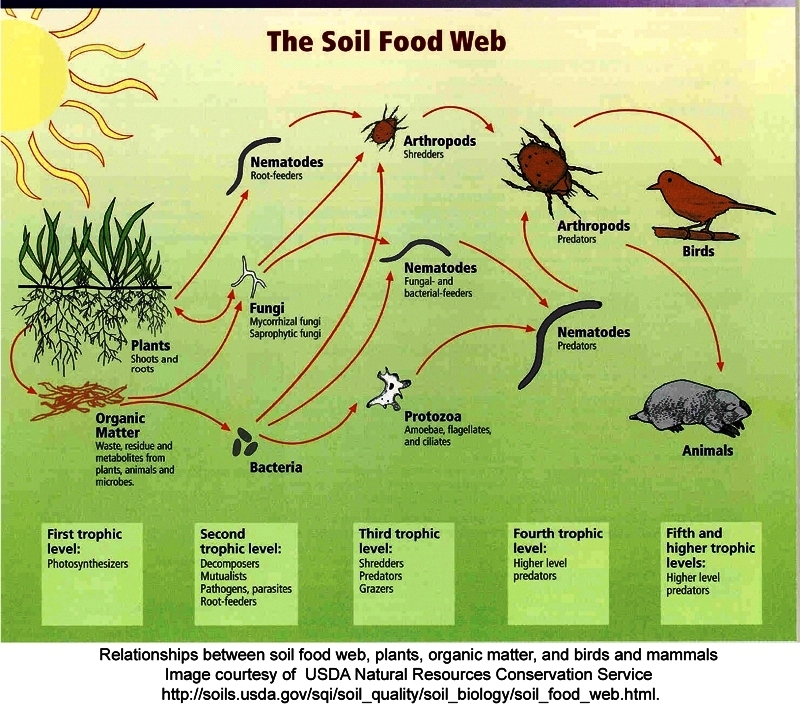 5.3.A1 Explain the relationship between soil ecosystem succession and soil fertility. First, lichens, which grow on rock, appear in a destroyed region. The lichens help break down the rock. Then, as lichens die and decompose, and weathering breaks apart rock, soil begins to form. As soil becomes richer, small plants like mosses and ferns appear, and the lichens start to disappear. The soil continues to become richer as plants continue to die and decompose, and flowering plants and grasses appear, bringing insects to the region. In time, shrubs and small trees cover the region, creating a suitable habitat for reptiles, birds, and mammals. As the shrubs and trees grow, smaller plants die from lack of sunlight and add more organic material to the soil. Eventually, the shrubs and trees die because taller trees cover the region. This all happens gradually over a long period of time. 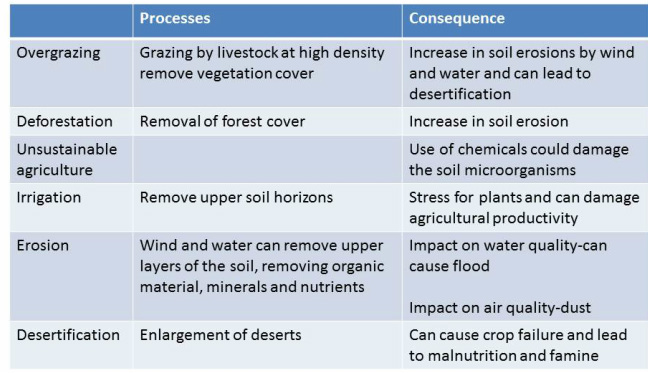 5.3.A2 Discuss the influences of human activities on soil fertility and soil erosion. Soil is a non-renewable resource that once it is eroded it is not renewed. Soil erosion is the permanent change of the main characteristics of soil that could see it lose its fertility, pH, colour, humus content or structure. Soil erosion occurs naturally by wind or harsh climatic conditions but human activities include overgrazing, overcropping and deforestation. Overgrazing occurs when farmers stock too many animals such as sheep, cattle or goats on their land. The animals damage the soil surface by eating the vegetation and either digging into wet soil or compacting dry soil with their hooves. 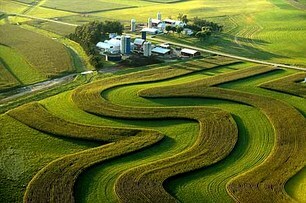 Overcropping is when the land is being continuously under cultivation and is not allowed to lie fallow between crops. This constant farming of the land reduces the soils ability to produce valuable humus for soil fertility as it is constantly being ploughed or stripped for crop growth. The soil becomes drier and less fertile. Deforestation is the cutting down of large areas of forests leaving an open, exposed landscape. Deforestation occurs for many reasons such as the sale of wood, charcoal or as a source of fuel, while cleared land is used as pasture for livestock, plantations of commodities, and settlements. The removal of trees without sufficient reforestation has resulted in damage to habitat, biodiversity loss and aridity (drying of soil). 5.3.A3 Evaluate the soil management strategies of a given commercial farming system and of a given subsistence farming system. The problems occurred were increasing salinity, soil erosion and loss of soil fertility. Farmers managed to reduce salinity and erosion, to reduce salinity summer fallowing or leaving bare soil for long periods were stopped or reduced. Snow fences or barriers enabled snowdrifts to pile up which provide water then they melt in. And to reduce erosion is used contour ploughing- along the contour lines instead of up and down slopes traps soil and water. Strip Cropping – growing as flax and tall wheatgrass at right angles to the wind. Great Plains of North America. 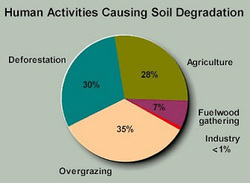 Variant use of soil systems can lead to different degradation and conservation. Our understanding of soil conservation has progressed in recent years—what constitutes progress in different areas of knowledge? Fertile soil can be considered as a non-renewable resource because once depleted, it can take significant time to restore the fertility—how does our perception of time influence our understanding of change? ​An animated introduction to soils functions and threats. ​The ELD initiative produced a short information film on the importance of the economics of Land Degradation. ​The Orinoco Basin extends across Veneuela and Colombia. The river's delta is covered with tropical rain forest. For many years now, colossal palm oil plantations have been encroaching on this forest. But the forest floor is relatively poor in nutrients and rich in oxygen, making it unsuitable for monocultures. ​Contrary to popular perception, desertification is not the loss of land to desert or through sand-dune movement. It refers to land degradation resulting from climatic variations and human activities. It is not a natural process; it is the result of mankind's actions. ​The plan to build a five thousand mile band of trees across the Africa begins in Senegal, where trees are already being planted. Contrary to popular perception, desertification is not the loss of land to desert or through sand-dune movement. It refers to land degradation resulting from climatic variations and human activities. It is not a natural process; it is the result of mankind's actions. Today, a third of land is threatened by desertification. In 1931 the rains stopped and the black blizzards began.